This old ‘cabinet card‘ photograph shows the New Zealand Shipping Company’s Ruahine (the first of three NZSC ships of the same name). Published by F. C. Gould & Son of Gravesend. The Ruahine was built by Denny & Co, Dumbarton. She could carry 74 first class, 36 second class, and 300 steerage passengers, as well as 71,000 carcasses in the refrigerated space! This entry was posted in Ruahine and tagged Ruahine on 24/07/2016 by printerspie. 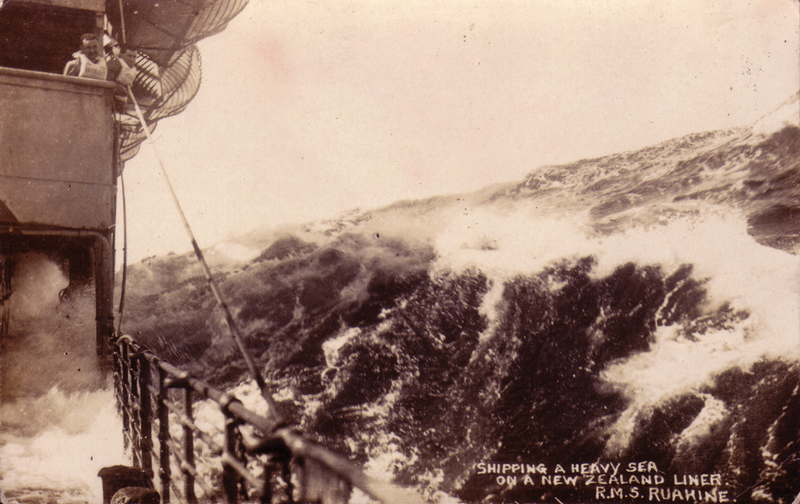 Ruahine in a heavy sea. Who was the photographer? Following on from my last Blog, here is another photograph of a heavy sea as seen from the Ruahine. There are two slightly different prints of the same photograph shown here. In the top one, someone has changed the wording by painting it out, adding a new code, and then copying the altered photograph. In the process, they have removed the initials of the person I presume to be the original photographer, and also the name of the ship. The new code, “A3792” represents the New Zealand-based photographer, David Aldersley. Some Aldersley researchers believe that David Aldersley was the photographer, but I have only been able to find him on one New Zealand Shipping Company voyage, and that was the one on which he emigrated from the UK to New Zealand. The lower photograph, which is the original, has the name of the ship, Ruahine, and also a copyright for “P.Z. Photo”. P.Z., I believe, was Peter Zerface, a barber who worked on board the Ruahine for many years, at least from 1916 or maybe earlier. Find out more about Peter Zerface here. 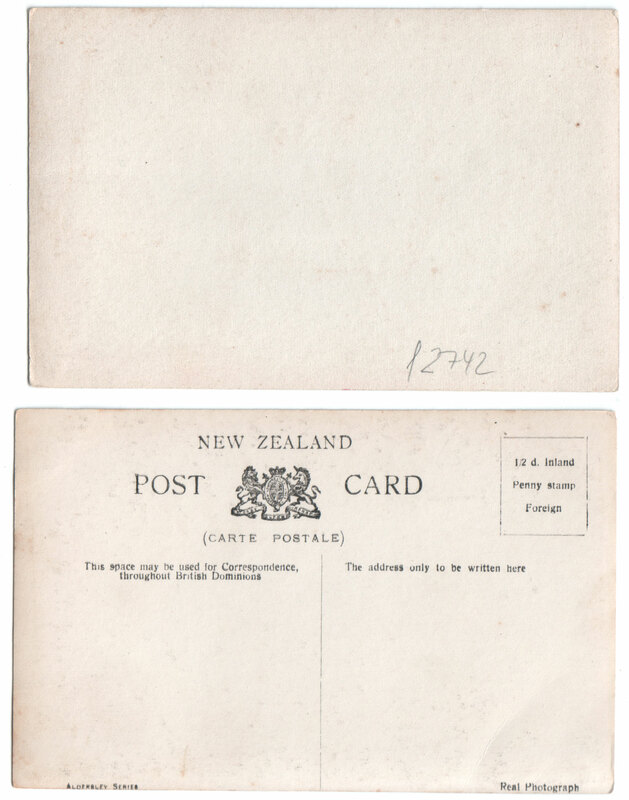 The reverse of both the postcards is shown on the right. To add to the puzzle, the top card, on which the text has been changed, has a blank back. The bottom card which has the “P.Z.” copyright on the front, is printed onto a David Aldersley photograph paper printed back. So why is this important? Well, it is important to me because a collector that I knew well, who died a few years ago, told me that I was obsessed with barbers because I also research Henry George Keyse (another New Zealand Shipping Company barber who signed his photographic postcards as “HGK”), and he said that the barbers would not know one end of a camera from another. He insisted that David Aldersley took all the photographs himself, including all the HGK photographs of Pitcairn Island, and yet never provided me with a scrap of evidence to prove that David Aldersley travelled more than once on a New Zealand Shipping Company vessel. That made me angry, and so I have set out to prove that I am correct, and I will be returning to this subject again on this blog. This entry was posted in Ruahine and tagged David Aldersley, Henry Keyse, Peter Zerface, postcard, Ruahine on 17/10/2015 by printerspie. I would love to know what year this postcard was written. 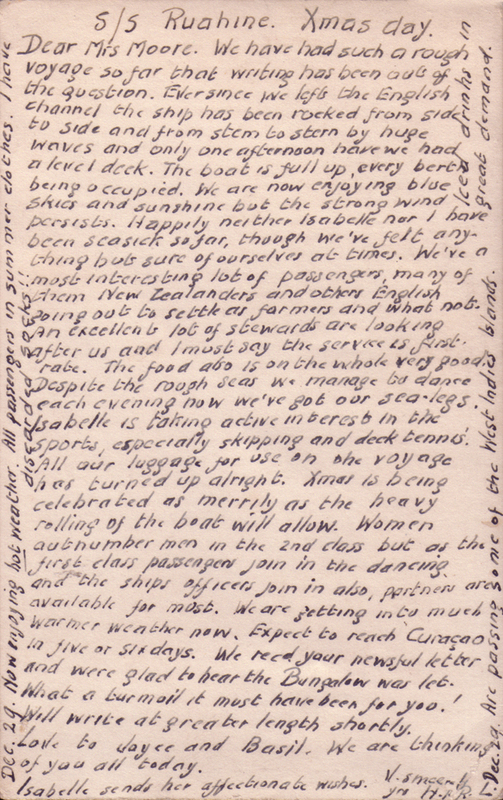 It is a very interesting report of events on a journey from the UK to New Zealand aboard the Ruahine. The writer states that the weather is so warm that they have even discarded their socks! Whatever next? We have had such a rough voyage so far that writing has been out of the question. 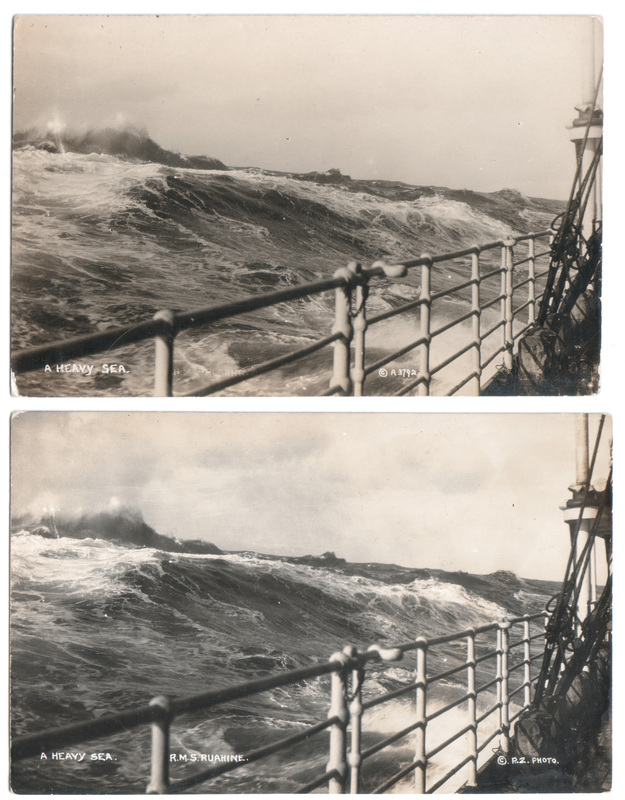 Ever since we left the English Channel the ship has been rocked from side to side and from stem to stern by huge waves and only one afternoon have we had a level deck. The boat is full up, every berth being occupied. We are now enjoying blue skies and sunshine but the strong wind persists. Happily neither Isabelle nor I have been seasick so far, though we’ve felt anything but sure of ourselves at times. We’ve a most interesting lot of passengers, many of them New Zealanders and others English going out to settle as farmers and what not. An excellent lot of stewards are looking after us and I must say the service is first rate. The food also is on the whole very good. Despite the rough seas we manage to dance each evening now we’ve got our sea-legs. Isabelle is taking active interest in the sports, especially skipping and deck tennis. All our luggage for use on the voyage has turned up alright. Xmas is being celebrated as merrily as the heavy rolling of the boat will allow. Women outnumber men in the 2nd class but as the first class passengers join in the dancing and the ships officers join in also, partners are available for most. We are getting into much warmer weather now. Expect to reach Curaçao in five or six days. We recd your newsful letter and were glad to hear the Bungalow was let. What a turmoil it must have been for you! Will write at greater length shortly. Love to Joyce and Basil. We are thinking of you all today. Isabelle sends her affectionate wishes. V sincerely yrs H.P.R. Dec. 29. Now enjoying hot weather. All passengers in summer clothes. I have discarded socks!! Dec. 29. Are passing some of the West Indies Islands. Iced drinks in great demand. This entry was posted in Ruahine and tagged postcard, Ruahine on 16/10/2015 by printerspie. So what did they eat? It amazes me that so many people, on such a long voyage, can be given such a wide choice of food. The new “Menus” page on this blog has a selection of Breakfast, Lunch, Tea, and Dinner menus dating as far back as the 1930s. Some of the old menus are quite fascinating, and there are also a few unusual ones celebrating special occasions, or with a much needed sense of humour during war-time. Two of my particular favourites are the Rangitata‘s High-Tea menu from 1942, and the Ruahine‘s Farewell Dinner menu from 1960 which has been signed by some of the passengers. Please let me know if you find your relative in the list of names by commenting below. And please consider making a small donation of £2 to Cancer Research through my JustGiving page. This entry was posted in Rangitata, Ruahine on 09/08/2015 by printerspie.